an austere, high-minded musician dedicated to the purity of the classical style. His veneration for the past and his mastery of the architecture of absolute music brought him closer to the spirit of Beethoven than any of his contemporaries. Brahms was a child prodigy who grew up playing the piano in the saloons and brothels of Hamburg, often paid in drinks. He began studying composition at age 13. From an early age he absorbed the popular and folk idioms – often in a Hungarian style - as an arranger for his father's light orchestra in Frankfurt. When he was 20 he met the Hungarians Liszt and Joachim. Joachim and Brahms were to become lifelong friends. This was to surface in his 21 Hungarian Dances, and the scherzo movements of various other works. He also met Robert and Clara Schumann who became his friends and mentors. His relationship with Clara was one of early infatuation maturing to a profound reverence and mutual friendship that lasted the rest of their lives. In an age that counted many virtuoso pianists such as Liszt and Clara Schumann - herself a child prodigy - Brahms also was one of the greatest performers of his age. He was offered a concert tour of America before his teens; but in spite of this, and the urging of his family, he set his sights on composition. He struggled to gain recognition in this until the publication of his A German Requiem in 1869; a work recognised as one of the masterworks of its genre. He had recently moved to Vienna, the capital of the Hapsburg Empire, and hub of cultural life. It suited him, and the works written in the next few years were to bring him fame and financial security. When he died in 1897 he was given a state procession with thousands walking behind his coffin. 3 Piano sonatas, plus many shorter works for solo piano – variations, intermezzi, fantasies etc., Miniatures, but many of them great. A German Requiem, Cantatas, and other works for chorus and/or voice and orchestra. Much music for unaccompanied choir. Dozens of folk song arrangements for one or two singers and piano. Brahms became quite the modern entrepreneur. These days, we walk out of the concert hall or recital room to be met by displays of the “Latest CD”. Brahms usually had the sheet music for 4 hand piano versions of the concert pieces on sale at the venue. Most Viennese families had at least two members proficient on the piano. It not only meant more profit from the concert, but it spread his music far and wide amongst the citizens who couldn't get to the concert. Even “A German Requiem”, as big a piece of music as one can hear, (often heard with over 200 performers) has not only a version for choir, soloists and two pianos; but a setting for two pianos alone! Reviewing the first performance of Symphony No. 1, critic Eduard Hanslick suggested that Brahms had relied rather too heavily on Beethoven, and that the regal string melody of the fourth movement was strikingly similar to Beethoven's "Ode to Joy" . Conductor Hans von Bülow agreed with Hanslick's assessment, and memorably tagged the piece "Beethoven's Tenth". Brahms is perhaps the major 19th century composer we know the least about. This was born out of his consciousness regarding his legacy: Towards the end of his life he burned most of his letters, as well as every composition he deemed "unworthy" (among string quartets alone, he is said to have burned twenty compositions). For this reason, a number of points about Brahms' life is shrouded in mystery, the most infamous being the conditions of his teenage jobs. Although their social status is contended, it is well known that Johannes' father was a spendthrift. 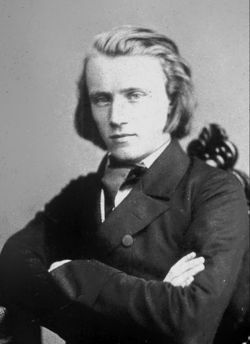 Brahms himself claimed he had to help increase the family income by working as a brothel pianist  (something that would explain his inability to commit himself to women later in life), but it has never been finally confirmed. The stories and anecdotes regarding Brahms' childhood are often contradictory, so it is unlikely that we will ever know for certain which version is correct. For Your Listening Pleasure Brahms, Ein deutsches Requiem. This page was last modified on 28 March 2019, at 23:22. This page has been accessed 10,576 times.